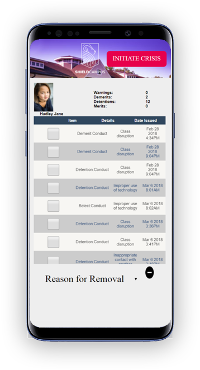 Introducing the most advanced single-interface integration of Crisis Management, Attendance, and Behavior Management for schools. A crisis can happen anywhere, anytime. By using the integrated student attendance platform, ShieldCampus will know which students are on campus and should be accounted for during a school-wide crisis situation. ShieldCampus turns paper crisis management plan into a mobile step-by-step action plan for staff to follow. The platform allows for real-time communication with first responders to quickly identify problems and parents to disseminate pertinent information regarding their children. Be prepared to manage the unexpected. Does your school struggle with taking student attendance consistently? Would you be able to accurately account for every student during the school day? ShieldCampus attendance assists schools to manage, monitor, and communicate attendance for their students quickly and easily. Behavior Management is an essential element in the education of today's children. ShieldCampus helps teachers manage behavior in their classrooms quickly and easily. The application captures and generates data on behavior that teachers can share with parents and school administrators immediately. This 16-minute intro video provides an excellent overview of ShieldCampus's integrated platform for behavior management, daily and emergency-situation attendance, and school-wide communications. Schools with interest in learning more about ShieldCampus are invited to call Mark Losey at 412-400-0932 or send us a message.